Tell me what you like to see, and create your own trip! Follow your own wishes! 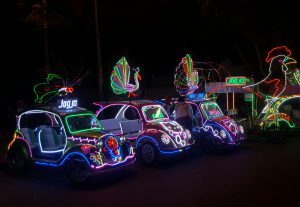 If you want to relax, or go on adventure, visit the “must-see’s”, or go off the beaten track, choose your own tour in Yogyakarta and get inspired by all the possibilities. 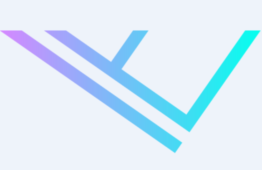 Contact me, without any obligation, for advice. If you have specific preferences and wishes (sports, hobbies, dance, cooking, history etc) let me know, and I can advise you the best places to visit. The Borobudur is the biggest and oldest Buddhist temple in the world. UNESCO recognised the Borobudur as World Heritage Site. In 1814 the Borobudur was rediscovered after the temple was hidden; covered under ashes and vegetation for hundreds of years. The temple is still full of mysteries. During restorations in the 1970s sculptured reliefs at the large base floor were brought to light. It is said that these reliefs were always meant to be hidden, in “the hidden foot” of the stupa, to prevent you from being tempted to earthly desire. 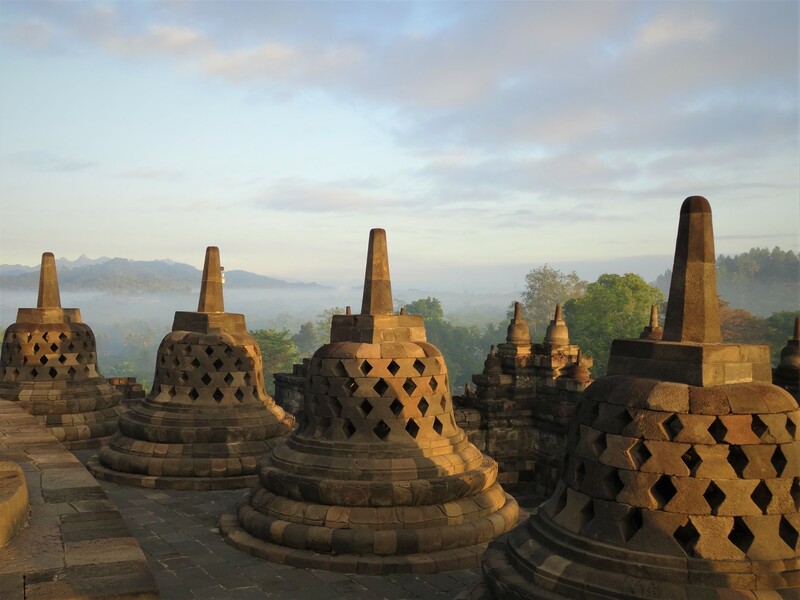 About 1250 years ago, the Borobudur was built close to where the rivers Ello and Progo meet, and a hill called “Tidar”. It is said that this hill is the place, where the gods ‘nailed’ the island of Java to the earth, to prevent the island from sinking or floating away. The temple is shaped as a stupa and built around a hill. If you count well, you can count 504 statues of Buddha. The walls consist of 2672 sculptured reliefs. In total, if arranged in a row, these sculptures have a length of 5 km. There are 72 bell-shaped stupa’s encircling the central stupa. Some of these stupa’s contain a Buddha statue, some are empty, and some statues are decapitated. In the past centuries, some statues and buddha heads were stolen and ended up in museums far away, or in the homes of the rich. There is a legend that if you can touch the Buddha with his legs crossed, any wish you have will be granted. The central stupa at the top of the Borobudur can only be entered by Buddist monks. Don’t be afraid, you won’t miss much; this stupa represents eternity and is therefore empty. Close to the Borobudur there are two other temples named Pawon and Mendut temple. These temples are part of the Borobudur World Heritage Site. The three temples are built in a straight line. During the Buddhist Vesak-festival, Buddhist in Indonesia walk from the Mendut temple, passing the Pawon temple and end at the Borobudur to celebrate “Buddha’s birthday”. In Mendut temple we will find three big Buddhist statues from the 9th century. We can also visit the Buddhist monastery where the Buddhist monks are studying their religion. At the Mendut temple, couples who would like to have children, pray for good luck. At the Pawon temple we only find the temple, there are no statues in there. On the outside we find a beautiful waringin tree. To see the sunrise at the Borobudur is an beautiful experience. But to see the Borobudur floating in the mist at sunrise, is a unique view, and a less common way to experience the magical atmosphere of the Borobudur. Off the beaten track and a spectacular experience, Punthuk Setumbu offers you a great and mystical panoramic views, early in the morning. Every minutes the rays of the rising sun will change the atmosphere. You cannot stop taking pictures, thinking the view cannot get better. The best time to arrive is around 5.30 in the morning , so you have to leave Yogyakarta around 3.30 h. Real early, but most certainly worth it. When the sun is up, and the villages are awake, you can catch some adrenaline, and try the swing, to enjoy the beautiful landscape in a different way! The Prambanan is a Hindu temple complex which was also recognised in 1991, as a UNESCO World Heritage Site. The Prambanan is built in the same period (around the year 850) and is located close to the Borobudur temple, which proves that on Java, Buddhism and Hinduism lived peacefully next to one another. The Prambanan complex consists of three main temples (up till 47 meters high) and three smaller temples. The three main temples represent the Hindu gods Brahma (creator), Shiva (destroyer) and Vishnu (sustainer) and the three smaller temples are dedicated to the animals these gods used for their transportation: a goose, a bull and an eagle. Next to the six bigger temples there are many smaller temples. Up till today not all of the 224 little temples are restored yet. You can still walk between the ruins and stones from the smaller temples. Imagine how the complex would have looked like 1250 years ago! The Prambanan temple is still mystical. 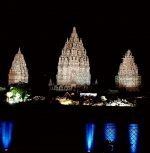 Locally Prambanan is known as “Roro Jonggrang” after a legend that Javanese people tell about the temple. Once there was a man named Bandung Bondowoso who fell in love with Roro Jonggrang. Roro Jonggrang was not pleased with his love, and to be able to refuse his love, she asked him to do something that seemed impossible: to build her a temple with 1000 statues, in just one night. But Bandung Bondowoso’s love for her was so strong, that he almost fulfilled her wish. Afraid she had to keep her promise, Roro Jonggrang asked the villagers to pound rice (a traditional dawn activity) and set a fire (to imitate the sunrise) in order to pretend the morning had broken. Bandung Bondowoso who stopped building, assuming the night was over, only completed 999 statues, felt cheated and cursed Jonggrang to be the thousandth statue. Prambanan also has panels of relief, describing the story of Ramayana. Experts say that the relief is similar to the story of Ramayana that is told orally from generation to generation. The Merapi is one of the most active vulcanoes of the world. The Merapi is (based on old legends) closely connected to Yogyakarta. “Merapi” means “mountain of fire” The Merapi is considered a sacred mountain. The vulcano is 2968 meters high. On the Merapi you find beautiful nature and beautiful views. Yogyakarta is situated at the foot of the volcano Mount Merapi. 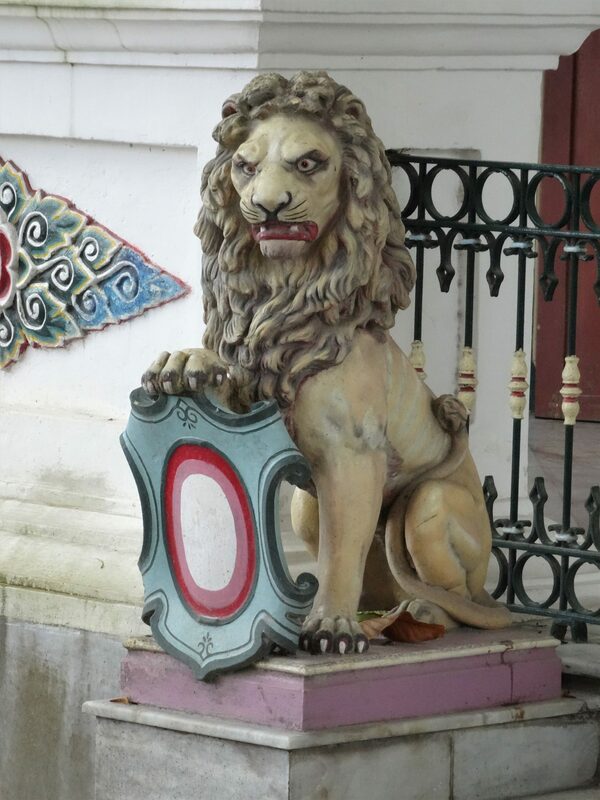 When the city was established in 1755 the Kraton (palace) of the Sultan was built in line with the Merapi to be in the centre of the power/spirits. In 2010 Yogyakarta was covered with ashes after an eruption. Many people living on the mountain had to be evacuated. You can still visit the affected villages and be impressed by the power of the mountain. On the Merapi, next to the spectacular jeep tours, you will find a small museum and remembrance sites. The people who used to live in the destroyed villages, now run the museum and the jeep tours on the mountain. 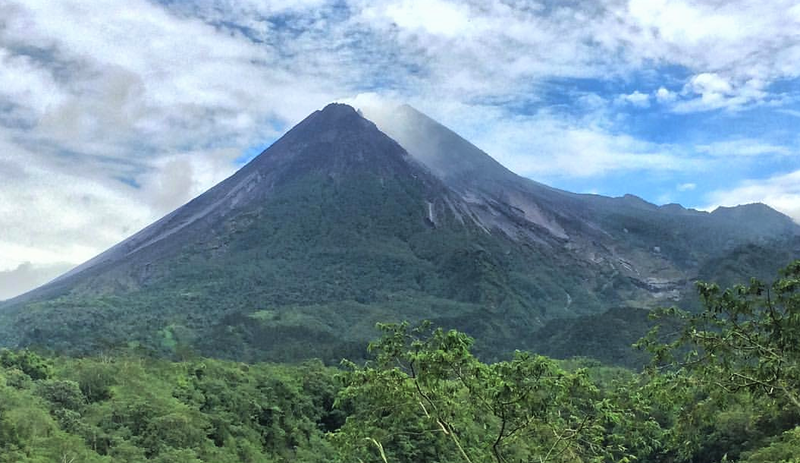 So by visiting these sites, you not only get impressed by the power and beauty of the vulcano, but you also support the local people who lost everything they owned in the eruption. Besides a lot of adrenaline, we will find the “alien stone” (a stone which looks like an alien) where we can take pictures. We will see the houses destroyed by the fierce heat clouds from the Merapi and the bunker which was designed to provide shelter when the heat clouds were coming from the Merapi. Untill 2010, Mbah Maridjan, an old man, was the spiritual guardian of the Merapi. He was appointed by the Sultan of Yogyakarta, and lived almost on the top of the vulcano. For his job he was paid a symbolic $1 a month. He was in touch with the spirits of the mountain and led ceremonies to appease the spirits of the vulcano by offerings of rice and flowers in and around the crater. He described his job, as: “Let the vulcano breathe, not to cough.” In 2010 when thousands of people had to be evacuated and more than 300 people were killed in an eruption, Mbah Maridjan felt it was his duty to stay on the mountain and, at the age of 83, he was one of the victims. On about one hour drive from Yogyakarta we find the ancient Vulcano Nglangeran, located in Gunungkidul. The ancient vulcano Nglanggeran used to be active until a 60 million years ago it is one of the oldest vulcanoes in Central Java. It started as an rock under the sea which rose above the surface during a vulcanic eruption. The mountain was formed by old vulcanic material and has two peaks namely the Western and Eastern peak with a caldera in the middle. Mount Nglanggeran is easy to climb. 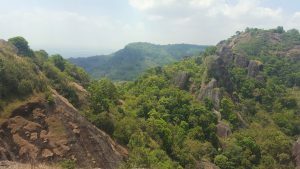 Only a 1,5 hour walk, through the beautiful landscape of UNESCO-Geopark Gunung Kidul will lead you to the Western peak. Based on old traditions only seven families are allowed to live on the mountain. If there are more families, one of the families has to leave, if there are not enough, a family needs to be found to join the community of seven families. If there are more or less than seven families it will cause bad luck. 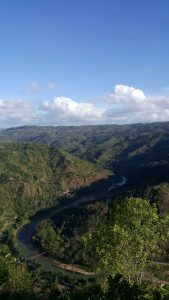 At Nglanggeran we have a beautiful view over the landscape, the unique shaped mountains, and the skies of clouds. There are many spots, and platforms build in the trees, on which you can relax and enjoy this beautiful place. Not only children will enjoy climbing to these tree-platforms…. Combine enjoying the beautiful and unique limestone landscape of Gunung Kidul with fun. Cool down while tubing down the river. A relaxed way to see the caves and riversides. The trip is easy, relaxed and safe and also suitable for children and the elderly. In about an hour, you follow the river while sitting in a tube. You will travel through the caves (with bats sleeping at the roof) and will admire the stalactites and stalagmites, stone pillars formed by water dripping or flowing from fractures in the ceiling of the cave. A relaxed way to cool down, and enjoy nature. How easy can life be? Yogyakarta has many beautiful beaches, which are not well known to foreign tourists. Enjoy the quiet and calm beaches to relax and cool down in the sea-breeze and water. 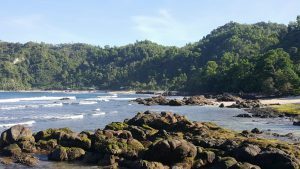 But be careful, Ratu Kidul (the queen of the sea) rules here and even well trained swimmers cannot go too deep, because of the strong current. Check the colour of your clothes before your leave…the story goes that Ratu Kidul doesn’t like the colour green.. 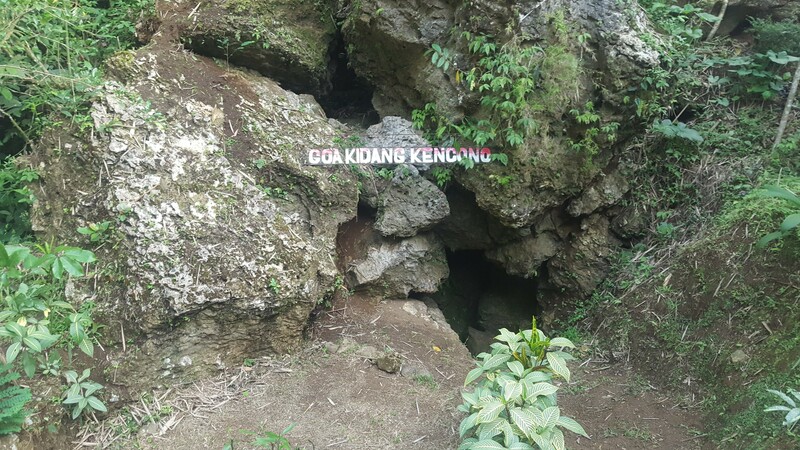 Explore the Kidang Kencong Cave with a guide. 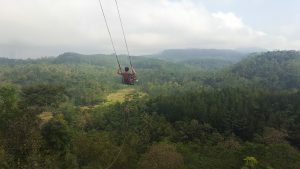 Hidden in the green scenery, North West of Yogyakarta-city, you will experience the real back-to-nature-spirit. With helmets and flashlights you will find beautiful stalactites and stalagmites, like you are the first to discover the cave. If you like an experience of the beaten track, and are not afraid of adventure, visit the Kidang Kencong cave! Tebing Breksi is an artifically shaped limestone rock, which unintentially remained in the landscape, after years of mining. The limestone hills in this area are formed by the ancient ashes of the vulcano Nglanggeran in Gunung Kidul. 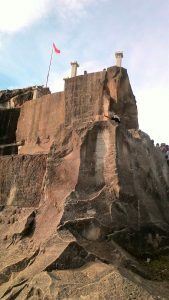 Local artists have sculptured interesting and beautiful sculptures in the walls of the cliff, and stairs make it easy for visitors to climb the rock. 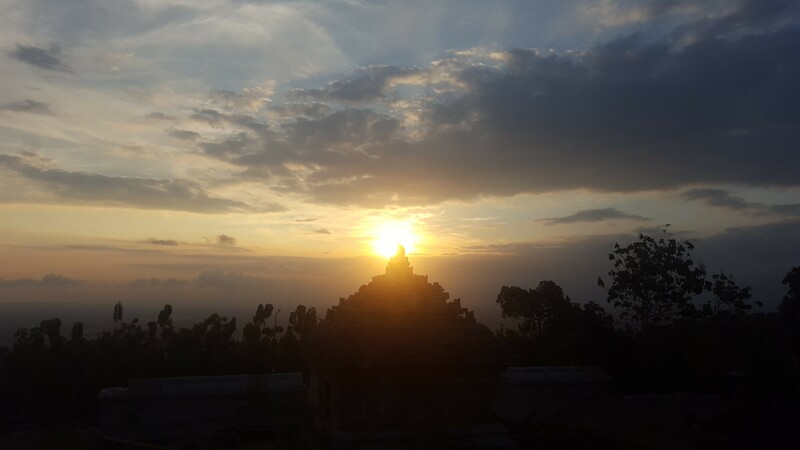 Together with the Ijo temple, Tebing Breksi is located at the highest place of Yogyakarta. This creates an amazing view over the city, the Merapi, the Ijo temple, and the Ratu Boko temple. In the morning you can enjoy the sunrise, in the evening a unique sunset. The Ijo temple is close to Tebing Breksi. In Javanese Ijo means “green”. The temple was built around the ninth century and is located 410 meter above the sea level. You can see a beautiful scenery and enjoy the view. The complex of the temple consists of 17 buildings. It is said that some inscriptions in the temple contain magic spells or curses, which are written 16 times. In the evenings, the Ramayana story comes to life. More than 200 professional dancers and musicians perform in the city of Yogyakarta or in the open air theatre with the illuminated Prambanan Temples as the background. A story about love, war and mystical events. A young princess is kidnapped by an evil demon. Her lover his brother and a monkey, take action to save her. The costumes, the dance, music and atmosphere, will enchant you. It will be a magical night. The theatre provides a summary of the Ramayana story on paper in different languages, and on screens the story is told as well, to make sure you fully understand the ballet. If you are travelling to Indonesia from November-April you can watch the Ramayana ballet performance at the Prambanan indoor theater. If you travel in the dry season you can enjoy the ballet in the open air theatre. 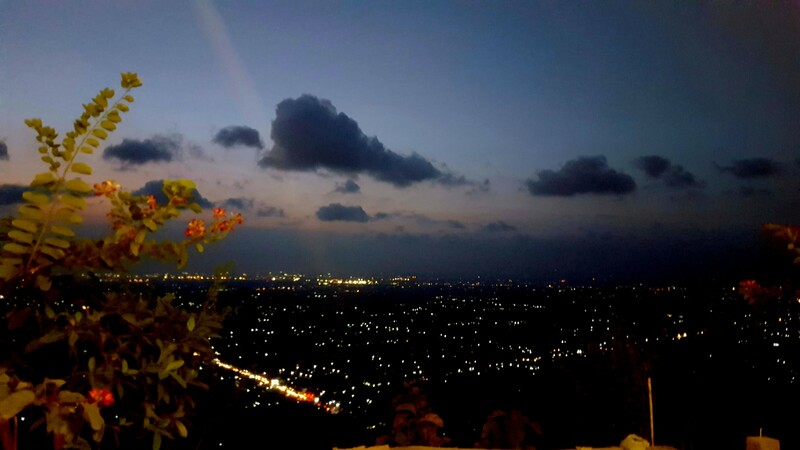 South of the city you find Bukit Bintang, a beautiful place to watch the sunset. After the sunset you can be amazed by the stars and city lights, far beneath you. A beautiful place to have (simple) dinner, relax and enjoy the romantic atomospere. In the city you can visit the Kraton (Sultan’s palace), Tamansari (the water palace) the colorful bird market, many museums, Malioboro street (shopping area), the Batik and Silver industry and many more interesting places. Yogya is a city with many students, which also accounts for a young and vivid vibe in the city. The people of Yogya are friendly and always willing to help. Visitors most certainly feel welcome. Yogya has great shopping centres, hotels, reataurants and offers a good range of tourist services. The Palace of the Sultan, is also known as the Kraton. The Sultan of Yogyakarta still lives here today. The Kraton serves as a cultural centre for the Javanese people and accommodates a museum with the sultanate’s antiquities. The Kraton was built in 1755-1766 after a treaty between Prince Mangkubumi and the Dutch VOC. The place where the Kraton was built, was picked carefully and is based on a philosophy: the important places of the city are built on a straight imaginary line. This straight line starts from Parangtritis beach, then leads to the Kraton, then to the main street of the old city, to Tugu Monument, and finally ends at Mount Merapi. This represents the relationship of the city with the guardian spirits of the Merapi and the beach of Parangtritis. Tugu Yogyakarta is the symbol of unification between the king and the people. In 1812 the Kraton was attacked by a British force of Stanford Raffles and burned down. Most of the Kraton was rebuilt by Sultan Hamengkubuwono VIII, who reigned from 1921 to 1939. The Kraton can be visited every morning. On certain days you can visit special ceremonial performances; like Gamelan, dance and puppet performances. Taman Sari (Water Palace), a remarkable complex of bathing pools that was built in 1765 for the first Sultan of Yogyakarta. One of the bathing pools was dedicated to the sultan’s harem, the Sultan overlooked the pool from a tower, so he could easily choose his company. 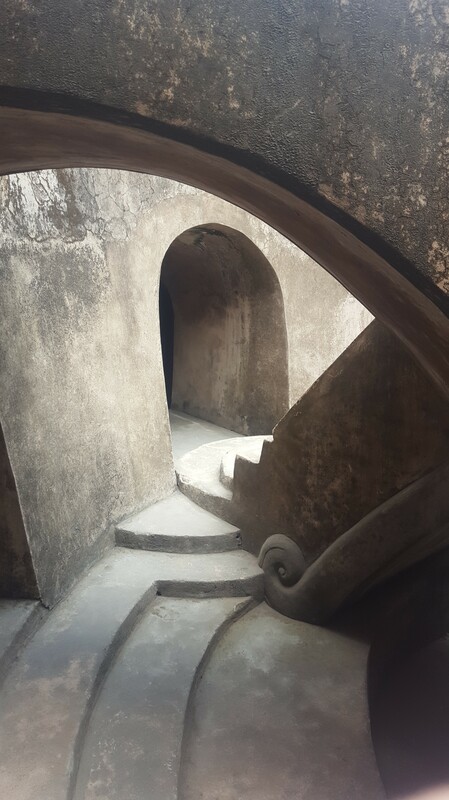 Next to Taman Sari we find a beautiful underground mosque. The kota gede is a historic neighborhood, now famous for its silver crafts. Visit a small silver workshop and see how silver jewelry is made as it was made for hundreds of years. Visit a batik factory where you can see the whole process of the batik making as it was taught generation to generation. Vredeburg is the old Dutch colonial fortress in the centre of Yogyakarta, now converted into a museum about the independence struggle. It was built in 1765, to make it easier for the Dutch to control the city. The castle was given the name “Rustenburg”. After the earthquake in 1867 is was destroyed and rebuilt with the name “Vredeburg” (castle of peace) to emphasize the intentions of peace. The front of the kraton faces the Merapi and has a big square in front of it, the alun-alun. The story is told that at the backsite of the kraton another alun-alun was created to make sure the mystical Queen of the Southern Sea was not offended. This square is called the alun- alun kecil (the small square) or alun- alun kidul (the southern square). The alun-alun kecil is used by the army of the kraton to work out. In the evening from 17.00 hours the place is a meeting place for the people of Yogyakarta. The children play with kites, and blow soap bubbles. You can rent a beautiful decorated luminated bicycle-cart and cycle around the square, just for the fun of it. At the sides of the square you can sit down on mats and order typical Javanese snacks. In the middle of the alun-alun there are two banyan trees. It is said that only those having pure hearts and who don’t have bad intentions can walk pass the banyan trees. People are blindfolded and try to walk straight for about 20 meters to pass in between the two trees. It is not only nice to try, also nice to watch all the people trying: it is more difficult than it seems and many people don’t reach the trees. Symbolically the game reflects the message that we all have to do our best to keep our heart pure, to achieve our goals.